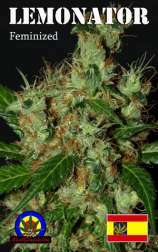 Here you can find a strain description about Lemonator (Next Generation) and also some user-based reviews and infos directly from the SeedFinder (if available). You can also find the offers and auctions here if Lemonator (Next Generation) cannabis seeds are on stock at MyCannapot right now. Special selection of lemon flavoured varieties, with genetics coming from both B.C. Indicas and from Spanish sativas. A very unique blend that we know you will enjoy. The Aroma is full and the buds are large. A great Hybrid for commercial and personal growers. Lemonator (Next Generation) is not available at our shop at the moment!